Disney recently surprised the CinemaCon audience at their presentation with a behind-the-scenes featurette for director Guy Ritchie's live-action adaptation of Aladdin. That video included footage from the set of the film featuring all of the actors all decked out in costume and acting out certain scenes in the film. It also featured the cast and crew talking about the film. It's been a long time since we've heard anything about this film, but now we know that it looks like Guy Ritchie has brought this world and these character to life in a way that I think fans will enjoy. Will Smith plays the Genie in the film and he's not the big blue version of the character you might expect. It's a human version of the Genie and Smith is sporting a mostly bald head with long braided hair coming off the top of his head. It was also made very clear that he would not attempt to copy what Robin Williams did, which is a smart move. Smith will be bringing his own personality and style to the character, and everyone seems to be very happy and excited with what he is doing with the character. Oh yeah! We also see him dressed up as woman! We also got to see some fun footage of Mena Massoud as Aladdin. The production team built an entire Agrabah city to play in and a lot of the footage we saw features Massound running around the city and jumping from building to building. Aladdin is going to be doing a lot of parkour as he tries to escape the sultan's guards! Guy Ritchie is definitely bringing his unique signature fast-paced style to this film. So if you're a fan of the films he makes and the style that he brings to them, you'll be happy with what he is doing with Aladdin. If you don't like it... I'm sorry! That's just how it's going to be. I actually think it will work really well for Aladdin though. It's definitely going to have some great action sequences. Naomi Scott as Princess Jasmine looked beautiful in the role. She fits that part so perfectly! This version of the character is said to be an even stronger and tougher woman than in the animated film. Scott says that “Jasmine is strong and speaks her own mind.” I actually thought she was a strong woman in the original animated film. We also got a look at Marwan Kenzari as Jafar, and he is going to be fantastic. 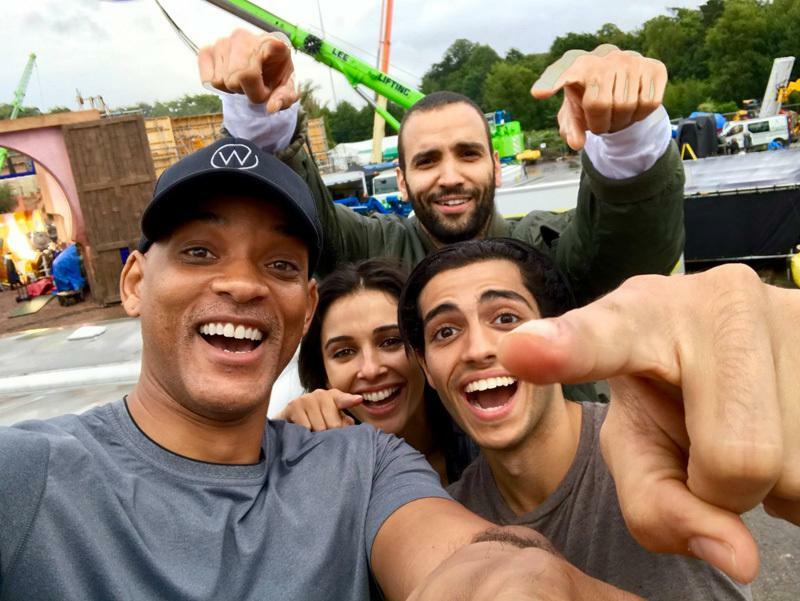 Two-time Oscar nominee Will Smith (Ali, Men in Black) as the Genie who has the power to grant three wishes to whoever possesses his magic lamp; Mena Massoud (Amazon’s Jack Ryan) as Aladdin, the hapless but lovable street rat who is smitten with the Sultan’s daughter; Naomi Scott (Power Rangers) as Princess Jasmine, the Sultan’s beautiful daughter who wants to have a say in how she lives her life; Marwan Kenzari (Murder on the Orient Express) as Jafar, an evil sorcerer who devises a nefarious plot to unseat the Sultan and rule Agrabah himself; Navid Negahban (Homeland) as the Sultan, the ruler of Agrabah who is eager to find a proper husband for his daughter, Jasmine; Nasim Pedrad (Saturday Night Live) as Dalia, Princess Jasmine’s hand maiden and confidante; Billy Magnussen (Into the Woods) as Prince Anders, a suitor from Skanland and potential husband for Princess Jasmine; and Numan Acar (Homeland) as Hakim, Jafar’s right-hand man and head of the palace guards. Aladdin will open up in theaters on May 24, 2019.